I love your card.... and what a fab imagine you have to come up with that idea! Last week's theme and this week's colours combined... fab card Vicky! I love this arrangement! What a fabulous idea Vicky, very original and so striking! a study in less is more! Congrats on being showcased. 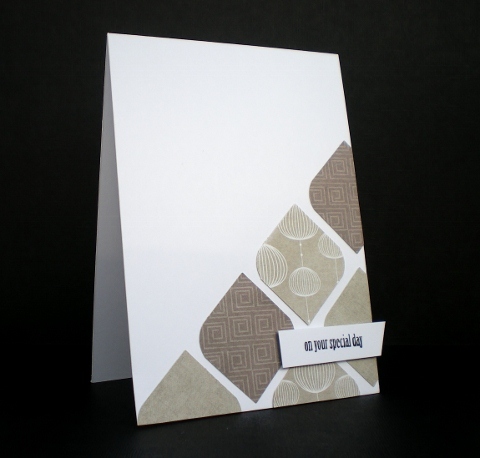 I love this card, rounding the corners is such a clever idea. Neutrals had me stumped for a while too. Got a feeling this card will be showcased too, it deserves to be. wow, it's a great elegant card! Absolutely PERFECT! Love this design! So clean and simple but so effective..it's absolutely stunning, Vicky!